I wasn’t very excited when George Lucas decided to do a prequel to “Star Wars.” I can’t get jazzed about Peter Jackson’s “The Hobbit.” But Ann M. Martin writing a prequel to “The Babysitters Club” is something I can really get behind. Like thousands of other women now approaching our late 20s and early 30s, I grew up with the members of the Babysitters Club. Of course I want to see what Kristy, Claudia and Mary Anne were up to before Kristy had the big idea to start the club when her mom couldn’t find a sitter for her younger brother David Michael. The BSC (as it is fondly known to fans) inspired a generation of young women in friendship and entrepreneurship. Now publisher Scholastic Inc. is hoping it will inspire a new generation of girls. According to The New York Times, Martin is writing “The Summer Before,” the prequel to the series. Scholastic will also reissue the first two volumes of the series (which have been out of print), presumably to garner interest in today’s tween set, which seems more interested in gossip girls and vampires than in babysitters. The relatively scandal-free series (I think the biggest scandal was when Mary Anne invited her boyfriend Logan along on a sitting job and was caught with a boy in the house) may seem tame to today’s readers, but the themes of friendship, family and working to get what you want could be exactly what little girls today are looking for - even if they don’t know it yet. i loved these books as a kid. they definitely were a part of what inspired me to start my own company. Is this true?! I was a total BabySitter's Club Nerd! I am happy to hear that the new generation will get to read these wonderful books about friendship and female empowerment! Who else did you know that had a 99% women run business at 12 and 13 years old successfully and democratically while balancing a social life and education? Thank You Ms. Martin for bringing back great memories and creating new ones! Dude! I loved this series growing up. I remember watching the short lived tv show and going to see the movie in theatres. I even got Stacy and Kristy Dolls for Christmas one year. It would be great for this series to return for young girls today to read. A new type of series not related to vampires, wizards and whatnot (tho I love the those books too). But I agree that I would like to see what happened to girls post BSC. I don't care what happened before the BSC. I would rather read a sequal that tells us what happened AFTER the BSC, like when they are in their mid-twenties...Now that would get me a LOT more excited. P.S. I LOVED the Super Specials. I'm a 30-yr old guy and I loved the Baby-Sitters Club! I was a little embarassed about carrying around those pastel-colored books but that didn't stop me. I would buy the student planners, the calendars, the videos, you name it. And yes, I do remember the "Super" editions, and do you also remember the BSC Mystery series? I had a huge collection of all the books, and one summer back in 1999 I was a day camp counselor and brought them for the girls to read. Well the entire box was stolen - I was crushed! I loved this series like so many others (I'll be 33 at the end of the month). I knew the first 30 or so books so well a friend could read a couple of lines and I would know exactly what book it was from. Last year, I was subbing in a middle school classroom, and the teacher had a copy of #6 or 7, the one where Claudia's beloved grandmother had a stroke. I still was crying, 20 years later. That was amazing writing – NOT Stephenie Meyer. Im 25, and I also remember reading my big sister's Babysitter's Club books way back when. But honestly, I think the movie sticks out moreso in my mind.....by the way, the Babysitter's Club movie still airs to this day, and I make sure that my daughter watches it now...who would have thought? LOL. Just a few weeks ago I took my 9 yr old to Half Price Books and purchased several BSC books for a dollar a book.. Then I showed her the necklace and charm I still have that came with one of the books I got many moons ago. She is really interested in these books and I have to admit that I have started reading them again myself. I have three boxes full of BSC, BSC super specials and BSC Little Sisters (I think that was the name) in my garage. My girls ran through them when they were little and I would read some to them at bedtime and dinner. I've also got boxes of goosebumps, SVH, SVH middle school, Are You Afriad of the Dark and the ever popular Pick your own way series. I can't bring myself to get rid of them. I keep hoping I'll be able to share them with future grandkids one day. I loved these books as a little girl! I believe that the reason I read today is because the enjoyment I experienced while reading The Baby Sitters Club series. I am so excited and hope that the prequel will inspire my niece as they did me! It is so exciting to see these books are back. Like a lot of people that posted comments on here, the BSC books were the first chapter books I had ever read. I just wish I had hung on to them... I must have donated them to Goodwill or something. I remember back in 1993, I was in the 3rd or 4th grade and I would finish one book and then I would spend my allowance at my local bookstore and buy the next book. Even having characters like Stacey, who has diabetes, helped me talk to my grandmother about her experience with the disease, and find out more about. I just recently turned 21, and I remember reading these books when I was in second and third grade. Unlike most girls, however, I found that they simply weren't for me – I would have rather read Animorphs or old mystery novels. While the themes in BSC are so much better than most of the things available to young kids (not only girls) and the "tween" group, they never appealed to me the same way they did to some of my friends (this was probably because I was more interested in playing baseball and romping around in the mud than other so-called "girly" things). I learned the same values from my family and from my own adventures with friends. But honestly, I think this is a great move for the kids that WILL benefit from the re-release of the Babysitter's Club. A lot of kids don't have the same benefit of having family that can sit down with them and talk nor friends that'll stand behind them in doing the right thing. Maybe, just maybe, this prequel and re-release will be able to at least fill part of that gap for more young girls (and boys) then the atrocious television shows they have now. I got the board game one Christmas! I still have the game. I LOVED this series. It was one of the first series that I ever read. I am 25 and remember reading all of the regular BSC books, the super series books and all of the BSC little sister books. I am so excited about the prequel and the re-release. I hope my daughters will enjoy them as much as i did. I am 28 and have very fond memories of reading the BSC book series. I used to order the books from the Troll book club every month at school. I even saw the movie on a few weeks ago and watched it with my 7 year old daughter and she loved it! I was so thrilled when I read this because she is a reader like I am so this will be something else for her to enjoy. She reads well and often reads book aimed at slightly older children so this will be perfect. Yay! I'm so excited, those books are great. I have a whole collection as part of our school ibrary and the 5th graders like checking them out. Now that they will be back in print I can buy better copies that are not old. This brings back memories!! I'm 31 but I can guarantee I'll be reading this prequel. I adored this series, and several have mentioned Sweet Valley High. Just seeing those words brings back a flood of memories. I also would skip the first few pages of SVH as they always said the same things lol how they lived in a split level home and shared their car. Wow...I feel like I'm 11 years old all over again!! Thanks. I remember going to a bookstore in the mall when I was in middle school to get Ann M. Martin's autograph! She was so nice and I was so nervous because she was my role model–I even started writing my own Babysitter's Club stories. I'll be in line to buy the new book when it comes out (and yes, I'm 28). Man, these were some of the ONLY books I got really psyched to read when I was about 11. I mean, I remember visiting my mom's friend, who had kids around my age, and all I did was sit in her hammock by her pool and read one of these until it was time to go home. I WISH I still had my copies to read to my little girl, but she's young yet and there's still time. Man, it seems more people read these books than I even imagined. Like the rest of you, I loved these books as a kid, along with SVU (and later the college years). Surprisingly, I'd actually forgotten about these books until I saw this article, but like many of you, they really started me into reading. I hope young girls today have as much fun reading these as we did back then. I am SO excited about this! I LOVED those books as a kid and I know my parents have them somewhere in their house – I'm afraid to calculate how much of my allowances were spent on those books. And yeah, the "Super Specials" did have white covers. I have a picture of one of my birthday cakes that had something to do with the BSC. I totally remember the Sweet Valley Twins stuff, too. First the New Kids make a "comeback" and now this! It's kind of like a second childhood, only now I get to enjoy it and not deal with my own adolescent angst but that of a 32-year-old woman. *L* Yay!!! Dawn Schaffer was my favorite character. I always wanted to be the laid back hippie California girl. Now I'm probably a mix between Stacy and Dawn. Weren't they bff's? Those books were so good and wholesome. I really loved them. I will eagerly await the prequel. Does anyone remember the movie that was released in the mid 90's? WOW! I am soooo very excited, I am 32 years old and I LOVED BSC.. I even tried to start my own. Can't wait to read it... I have to admit I LOVED Claudia.. LOL I'm such a dork! Say hello to your friends! (Babysitters club) say hello to they peeeople who care! Say hello to your friends! (Babysitters club) Cuz you know that your friends are always thhheeeere... yah.. I'm so excited! I read all of these and remember being sad to donate them all to the local library once in high school. I will most definitely read the prequel to take me back to the days of voraciously reading BSC, Sweet Valley Twins and then Sweet Valley High (behind my parents' backs because they thought I was too young). I definitely credit my reading habit to those books and hope to be able to convince my neices to start reading them! these were my favorite books!! I was at the library last month and asked about these books (yes, I'm 30 with no daughters) and I was so disappointed that they didn't have any! I gave all my old ones to my neice, but I think I am going to have to ask for them back! My sister grew up reading the BSC and since I followed my sister's footsteps, my mom and dad started to by me the BSC Little Sister's books. It was about Kristy's little sister Karen. My mom recently gave me my LIttle Sister's book collection (1-20) and I handed them over to my daughter who is 9. She loves them!! I also was able to find the next 20 books on ebay – can you belive there is around 140 books? I loved those books and can't wait to see these come back out! 🙂 Thank you Ann Martin! I have about 60 of her books sitting on my bookshelf. Loved them so much I cant give them away. Even though I haven't opened one in 15 years! Fun and CLEAN! Which is saying a lot anymore. LOOOOVE IT! cannot wait. i wish i had kept all of my books. ...but I watched anyway and ...WHOA! I loved this series. I used to get my mom to buy me the next book in the series, go home and read it in about 1 hour, and then beg her to go back to the store to buy the next. Loved the Superbooks. I have the complete series, and still have lots of R.L. Stine, Christopher Pike, SVH. Also loved to read the books that let you change the direction of the story at the bottom of each page. The BSC series was what got me hooked on reading when I was a kid. I still have them all in a box just waiting for when I have a daughter and she gets old enough to read! I absolutely loved these books as a child and would read them over and over again. I was so little! I remember going to the Waldenbooks in the mall before my ice skating lesson and sitting in the back reading the latest copy. I would dogear the page and hide it until the next time I was there. I didn't think it was a big deal at all and mentioned it to my mom one day and she was mortified! I, too, would skip to chapter 2 since the first was a repeat from book to book (same with SVH, I get it, the girls are blond with "eyes the color of the california ocean" LOL). I remember mailing away for the next installments of BSC and thinking that Ann M. Martin would personally process each request, so I would write her notes on my form, hahahaha. I loved these the BSC, I was a Scholastic member so I had all the books, I only had boys so I recently took them out of my sisters attic and gave them to my neighbors grandaughter. Of course I looked through them first and they brought back lots of memories. I am so glad they are bringing them back!!! I hope people don't get this confused with "The Babysitters" Movie. I loved this growing up! Even had the movies! I'm so singing the song in my head now!!! my SIL and I were just talking about BSC a few weeks ago. I wish I still had the books. I was so proud of myself once when I read an entire book in one afternoon. This series definitely started me out on my love of reading. I'll be sure to get my own copy of the prequel. If Scholastic is going to reissue the first two volumes, does that mean they are going to reprint the whole first series? I am trying to complete mine that I found and that woud be awesome! These were the first chapter books I read as a child in 2nd grade (1992). I was a Kristy! Without a doubt, the biggest tomboy on the block! I had always thought my beloved baby sitter's club books were gone years ago! Probably in a goodwill bin somewhere...I mentioned the books to my mom a few months ago and it turns out that she had donated them to the church's free library. When I asked her about them, she said they were all still in the church basement. The pastor of the church gladly returned them to me because no one had checked them out in years. A piece of my childhood that I thought would be gone forever returned to me 15 years later! I LOVED these books when i was in middle/high school! God, I loved these books! My mother took me into Manhattan when I was 8 or 9 to meet Ann M. Martin and have her sign the first two books for me. I think I cried. I even made my own "Kid Kit" and had the board game! I hate to sound like my grandmother, but it's so nice to see them bringing back something so sweet in this time of Bratz, Miley Cyrus pole dances, Gossip Girl and the crap piles that are Twilight (I'm sorry, I was raised on Anne Rice and Buffy...Vampires DO NOT go out during the day, and they CERTAINLY don't SPARKLE!). can you believe this! I thought you would like to see this. 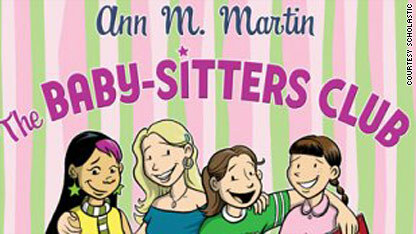 I used to love to read the Babysitter's Club religiously!! Such a great series, of real quality. Many great values were taught in the series, while still remaining "cool" and interesting while I was in late elementary and early middle school. I think that it is great that there is going to be a prequel. I hope it is just as successful as the other BSC books! Loved these books as a kid! Though I always remember skipping over the first part of the book that would go over the girls in the club and how it all worked. It got a little redundant. I always loved the Super Special books. I can't wait to read this! (and I'm 34) I think I only read the first 14 or so before I grew out of them, but I read the ones I had over and over. I should try to find them – I'm sure they're still all at my parent's house. Oh reading these posts is taking me back, too! I loved BSC, SVH, R.L. Stine, and anyone else remember the author Christopher Pike? I think my library shelved all these series together so I read them all. I didn't realize so many other people had such similar childhood reading experiences, that is so great. I wanted to start my own BSC but my parents wouldn't let me. I wanted to be Kristy, Dawn, and Stacey. I hope the series has a comeback. I hate the tv shows that entertain tween girls today. This is great! Like a Blast from the Past! This was a great series for young ladies to read and become influenced about responsibility, friends, and life in general. It's refreshing to see this interest get sparked in the series once again. As an elementary school librarian, I am tired of seeing Goosebumps and Twilight be the only books kids want to check out. This is just the series to invest in once again. Time to pull them off the shelf! i loved these books growing up and cannot wait to read this one!! Sarah -the babysitters club will be back!! ahhh – SWH is going to be a movie this year!!! What a wonderful blast from the past! I adored these books and was signed up for the fan club and everything... I'm sure I still have BSC pencils lying somewhere around my parents house. How strange, I was just wondering a couple of weeks ago what Ann M. Martin was up to these days – glad to see she's bringing the characters I grew up with back to life! Loved Sweet Valley High!!! And R.L. Stine's Fear Street!! I loved these books when I was a child. I held on to the roughly 20 or so that I had and my almost 7 year old daughter is now enjoying them! I thought these books were the best as a kid! I always fancied myself a cross between tomboy Kristy and geeky Mallory. Come to think of it, I still do. aaaaaaaaaaaaa!!! I was a BSC fanatic!! I vote for a prequel and a sequel, Ann M. Martin!! I'll be waiting in line for this one. Man, I was addicted to those books. Good times! Loved BSC! Someone just commented about Sweet Valley High!!! Loved that too! Wow...that was a long time ago! WOW!! I remeber reading the BSC books faithfully!! I even sent out to be a member of the book club so I got books every week, which was the most exciting thing in the world then!! I totally used to read these books! Religiously. Hahaha. How awesome–I hope the girls of this generation enjoy them greatly. Give them Goosebumps & Sweet Valley High, too! I don't know if that photo at the top of the story is a new version of the logo or if it was the original version, but I can tell you that all of my Scholastic copies had realistic paintings of the characters as covers. Remember when they came out with the "super" BSC books where everybody went on a trip? I think they had white covers. Reminds me of the other must read of that era...>Sweet Valley High! I have given my 8 year old my books and we read them together. Oh, the DAYS!!!! ...well, you'll just have to google it. Oh my gosh, what a blast from the past! Memories! I remember being jealous that Mary Anne got the cute boyfriend, and thinking that I was just like Claudia because I hid candy and snacks around my room (to keep them away from my brother, of course! ).....What fun! Yay! I loved these books growing up. Brings back awesome memories! I just go those books out of a box in the basement and put them up on the bookshelf so my 5 girls can enjoy them. Glad to see that they are back in print. Wow I really wanted to be Stacey McGill when I was a kid! I love that series! i still have my copies of the BSC in a box at home! i loved them when i was younger! i would prob read the prequel just since i grew up with the characters! That series really did spawn the entrepreneur in me!! My best friend and I tried our best to start our own babysitters club!! Gosh, this takes me back!! Best books ever!! Sorry but is the babysitters club. I think my sister's liked this crap. Wow. I absolutely loved the BSC series when I was younger... at one point I regularly went to the library and to the bookstores (and was a faithful Scholastic suscriber!) to get the newest "chapters". My friends and I would discuss our favorite plot points during recess! I always wanted to be like Claudia, but in my heart I knew I would be Mary Ann to the end. It's going to look so lame when I (a 31 year old women) takes this out of the library! But I can't wait! I loved these books growing up. I remember pouring through bookstores, book fairs at school, goodwill all trying to stay as up to date as possible with this series. I hope the series catches on now, as it did back in the 80's. I read this books religiously when I was a teenager! My parents probably still have them boxed up in their attic somewhere!